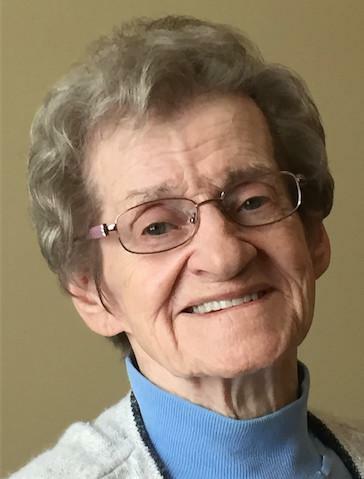 It is with great sadness that the family of the late Miriam Griffin announce her passing on Monday, December 3rd, 2018 at Corner Brook Long Term Care home at the age of 92 years. Leaving to mourn with fond and loving memories are her children: Theresa Griffin (Peter Straubel), Myles (Phyllis), Peter (Darlene) and Patricia Griffin (Randy Heppell); eight grandchildren: Jamie (Rosa), Leah (James), Jill (Patrick), Cheryl (Dean), Pj, Stephanie, Patrick and Brady; seven great-grandchildren: Andrew, Erika, Lisa, Megan, Ellie, Emma, Maximo; two sisters: Marie Harrietha and Lenore DeGruchy; as well as many other relatives and friends. She is predeceased by her husband Patrick Joseph Griffin, 1994, brothers Jimmy, Charles, Louis and John; sisters Claire and Carol; and by her parents John James and Jean Almon. Friends and family may visit Fillatre’s Funeral Home, 218 Curling Street on Wednesday and Thursday from the hours of 2-4 and 7-9:00 p.m. The Funeral service will take place on Friday, December 7th, at 10:30 a.m. from Sacred Heart Parish with Father Jim Robertson officiating, cremation to follow. The urn burial will take place on Saturday, December 8th at 11:00 a.m. at the family plot, Mt. Patricia Cemetery. As expressions of sympathy in lieu of flowers donations may be made to the Alzheimer’s Society or to the charity of one’s choice. Messages of condolence may be left for the family by visiting our website www.fillatre.ca.